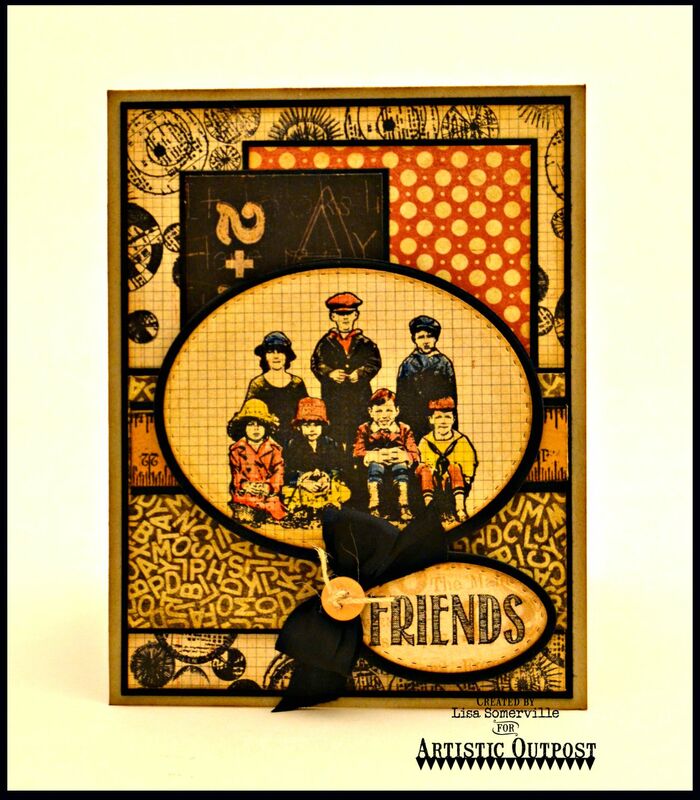 Welcome to the Artistic Outpost Design Team August Blog Hop! Each month, the fabulous designers at Artistic Outpost showcase projects created with various Artistic Outpost stamp sets. This month, it's "Designers Choice", as the Designers are sharing projects they created using the AO stamp sets of their choice. I went with a Back to School theme using the Springtime, Chalkboard Wisdom and Whimsical Melange stamp sets. I stamped the grouping of children on pattern paper, then die cut the panel using Our Daily Bread Designs Stitched Ovals Dies, layering on a Black panel that was die cut using the Ovals Dies. The image is colored with STAEDTLER Watercolor Pencils, blended with Gamsol. For the larger background panel, I randomly stamped the circle collage from Whimsical Melange in Black Archival. The word friends is from the Chalkboard Wisdom stamp set, stamped in Black Archival on a scrap piece of the pattern paper, die cut with the Stitched Ovals Die and layered on a Black panel that was die cut using the Ovals Dies. Lisa, I really love the various papers layered in your background and framed out. It really makes those kids pop right out. Love your card! Killer card! Great papers and layout for those little kiddies! Lisa, the background papers look amazing with the "kids" and love that "back to school." Love this card!